One of Park City, Utah’s attractions that have something to offer year-round, this world-class sports facility was the site of 14 of the games during the 2002 Winter Olympics. The Utah Olympic Park houses athletic training grounds where you can watch current and future Olympians honing their skills, or even experience a bit of sporting yourself. You can try bobsledding on the 70mph track accompanied by a trained driver, and in the summer months, strap up your skis and take advantage of the park’s ski jump, or zoom around a stainless steel Alpine slide. This Park city, Utah destination also houses the Joe Quinney Winter Sports Center that provides an interactive journey chronicling Utah’s ski history, as well as the 2002 Eccles Winter Olympic Museum showing Park City’s Olympic experience. A testament to the quality of Park City, Utah’s 3,300-acre ski mountain is the fact that the US Ski and Snowboard Olympic team has chosen it as its training grounds. The oldest of Park City’s three ski resorts, a chairlift awaits to take you through the center of the town as you arrive at the resort. 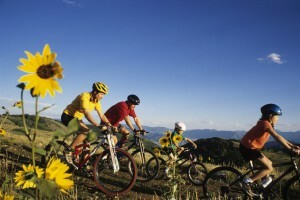 Park City Mountain is also known for its diverse terrain that includes over a hundred runs. The resort’s wealth of winter sports options include skiing, tubing, ice-skating, and sleigh riding. For the summer months, Park City Mountain resort is best enjoyed from the majestic vantage point of its Alpine Slide; a 3,300-foot-long-track. Thrill seekers can zip line down the mountain 100 feet above the ground, or tread through the resort’s dirt roads and single track trails for hikers and mountain bikers. Impassioned skiers will find this resort a haven because of the fact that no snowboards are allowed on this swanky resort’s exclusive trails. Spread out over four mountains that include 100 runs, six bowls, and 21 lifts, the resort caters to Park City, Utah’s affluent lot with the penchant for immaculate trails, ski valets and heated sidewalks. Similar to some of the fore mentioned Park City attractions, there are things to enjoy in this resort regardless of the weather. When the mountainsides turn green, a chairlift provides an impressive view of the trails that likewise allows for hiking and biking. Concerts, like the Deer Valley Music Festival heat up the resort even more during the summer months with jazz, classical and contemporary live musical performances. They say that to truly appreciate the beauty of Park City, Utah, one must head on to this 10,000-suare-foot environmental and educational facility that overlooks all 1,200 acres of the Swaner Nature Preserve. There are unique attractions designed to educate like its two-story interactive wetlands climbing wall that shows the ascent from the soil to the top of cattail. The nature preserve stands as THE place in Park City, Utah for free guided tours of the surrounding wetlands. Sitting just four miles north of Park City’s historic Main Street, The Canyons is a 3,700-acre mountain resort; the largest in the City. Designed for intermediate to advanced skiers, there are 17 lifts and 163 trails, while also having six natural half pipes to cater to snowboarders. For those looking to experience The Canyons for more than a day, find out the best lodging deals by calling the Central Reservations Office. Like most of the destinations listed above, the summer months find The Canyons serving hikers and bikers, while also being a venue for weekly farmer’s markets and providing a scenic gondola ride. Boomtown mining days, ravaging fires, and adventurous prospectors are just some of the elements coloring Park City, Utah’s rich history, and they are all exhibited by this guided tour. Through 45 buildings and historic sites, a tour guide will engage you with accounts and stories about the city’s landmarks that have withstood the many trying times that the town has had to withstand. Chimayo – From its glazed and terra cotta tile work, to the colorful flower arrangements, to the scrubbed woodwork, the restaurant visually transports you to Mexico. The inviting surroundings accompany French and American techniques with Southwestern ingredients hat lead to mouth-watering dishes from the description alone. Chimayo may be a bit pricey, but truly ideal for special occasions and trips toward self-indulgence. Wahso – One of the city’s most popular restaurants, it blends yellow walls with black architectural trims, potted palms, and large-scale Asian artwork to produce a refined and sophisticated ambience. Far East influences combined with French techniques are used to come up with favorites such as Burmese curry, Asian vegetable hot pot, Balinese stir-fries, and exotic steaks. Mariposa – With its rustic yet upscale setting, Mariposa has become a favorite among ski visitors. The American menu that boasts of lamb, venison, pheasant, wild boar, and foie gras is anything but basic, and along with a host of wining options, it’s a must try with every visit to Park City, Utah. About the Author: Jim Bizily is an entrepreneur and owner of Park City Rental Properties – a Park City vacation rentals and lodging business . Jim resides in Park City, Utah with his wife and two kids.